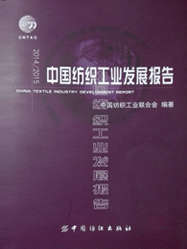 The China Textile Industry Development Report edited by China National Textile & Apparel Council. It is the only one of white paper for Chinese textile with authoritative, forward-looking, researchable and instructive. The book focuses on the annual report on the development and trends of the whole industry of China's textile industry, chemical fiber, cotton, wool, silk, hemp, filament weaving, printing and dyeing, knitting, garment, textile, industrial and textile machinery manufacturing. This series of books has been published for 15 years, and total 15 editions, one yearly one edition. It has become the industry famous of brand books, which its clear view, rich in content, informative, strong guidance, and popular in China. The China Textile Industry Development Report 2015-2016 include industry operation, technology innovation, brand and quality, industry research, economic forum, raw material supply and demand, industry news, industry awards, statistics and other columns. It’s to strengthen the new situation study for the impact of China's textile industry. The columns are diverse and readable, rich of informative and detail, open novel of perspective, in depth research and with a high use and reference value. The book is mainly for domestic and foreign textile industry and related enterprises, government and industry associations, as well as financial and investment, trade and consulting, research and educational institutions. It is have highly value with use, research, collection and reference. China Textile Industry Development Report 2015-2016 was officially published by China Textile & Apparel Press in May 2016, Chinese version priced at 56 USD per copy (Not including postage), limited number of it , welcome to subscribe.